Even tho things looked like they had stabilized for Yoko this week, last night and today she was having trouble swallowing her food and water. The tumor in her mouth was growing rapidly. Often she would gag after trying to eat. Rather than wait until this got any worse we chose to help her to the Bridge this afternoon. 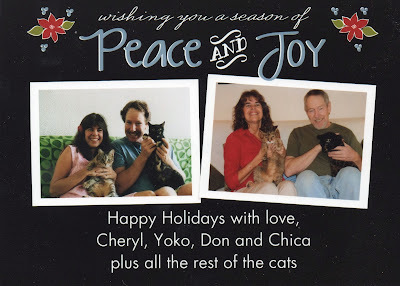 This is so hard - last year we had our Christmas card made up showing an old photo of Chica and Yoko and my husband and I, in Florida 19 years ago side by side with a photo of all four of us in 2012. 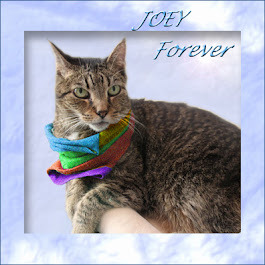 Here it is, not quite a year later, and both dear kitties are gone along with our Joey who left on Dec 7, 2012. I must have known somehow that it was the end of an era. 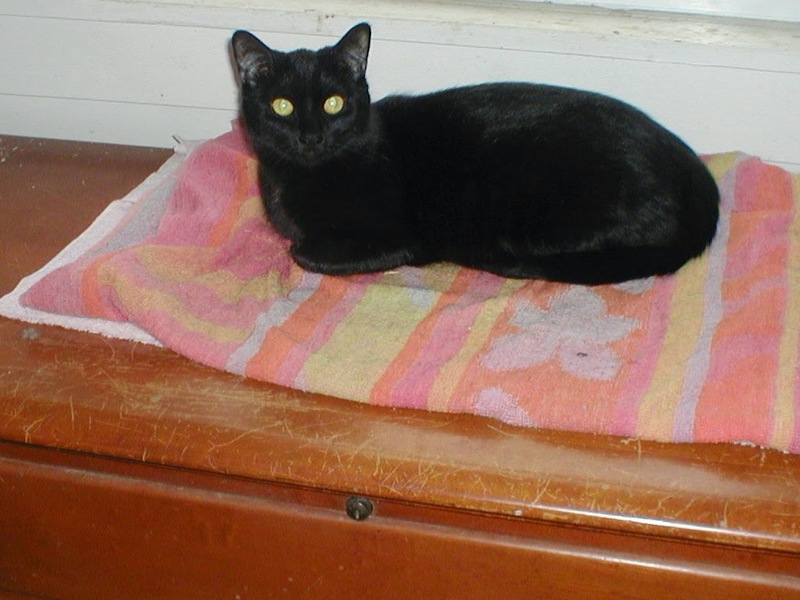 We got Yoko as a kitten at the local shelter to keep Chica company but Chica would have none of it. Yoko was the only cat we have had since she was a kitten. All the others came to us at six month or older. Yoko was tiny and her eyes were still blue but grew to a big ladycat of hefty size. Her feet seemed so big but she grew into them. 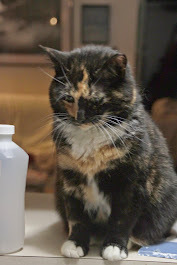 She was our Buddha cat - doing everything very slowly, methodically and focused. She ate deliberately, savoring and chewing every bite. She even made biscuits slowly, with her eyes closed in a blissed out state of contentment. Being with her, taught us patience - to sit, and not rush around, to be still and savor each moment. Her disposition was quiet and gentle altho living with Chica picking on her so much, Yoko learned to growl menacingly if she did not want to do something. It kept Chica at bay and as we took in more cats, Yoko mellowed out with age, even grooming the other youngsters. She favored my husband over me. He could get her to do anything but I would get the growl if I tried to give her a pill, clip her claws, etc. while Don could do all that without a peep out of her. She loved to lay on his chest with her paws on each shoulder and her body stretched out full length down his like a fur tie! She preferred to make snug hideaways in piles of blankets, laundry or bedding. Once I picked up a pile of dirty laundry to put in the washer and I knew she was in it even tho I couldn't see her - it was very heavy. Sure enough she had curled up inside the clothes. 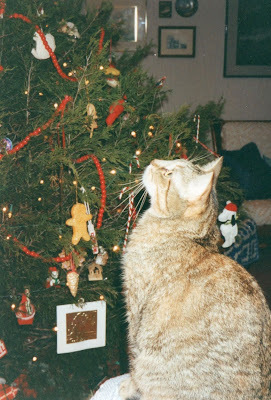 Even since she was a tiny kitten, she loved the Christmas lights on the tree - she would sit on the floor or chair next to the tree and just stare into it for long periods of time. 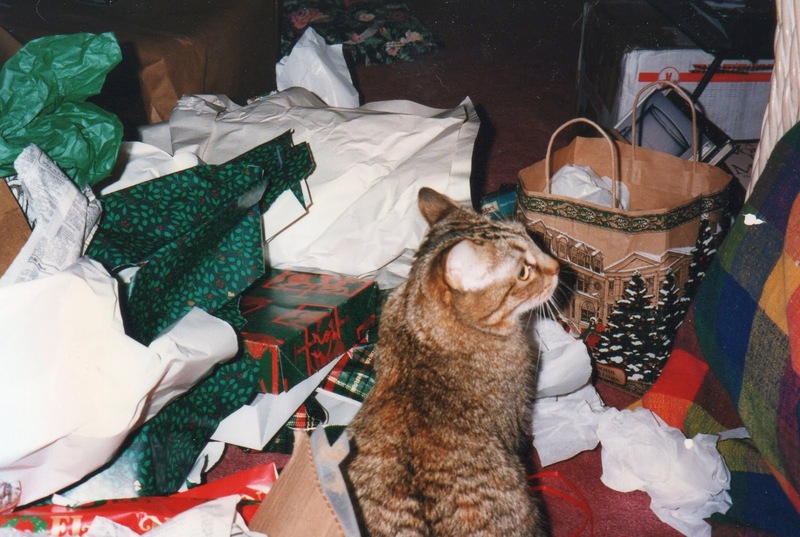 She enjoyed the unwrapping of gifts and would make the discarded paper another place to make a snug bed. 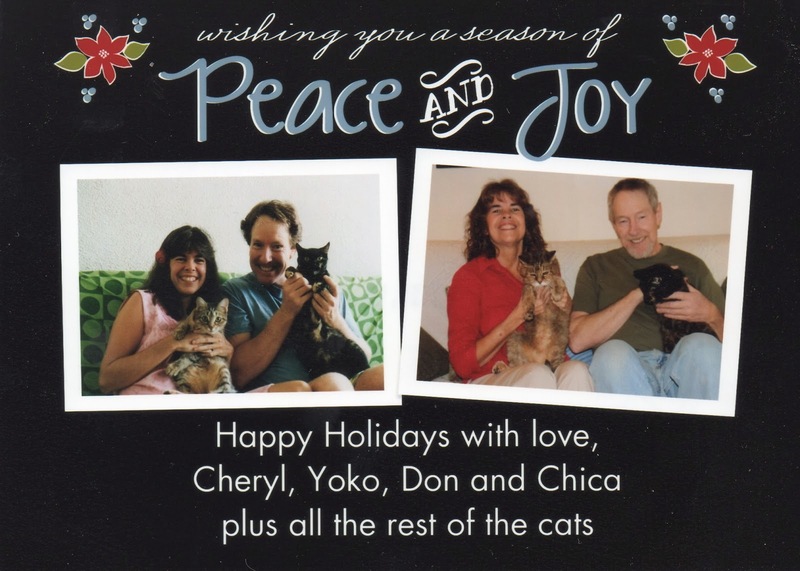 We buried her on our land with a bouquet of fresh pansies and the Santa hat all the kitties are wearing in this year's Christmas card - Yoko will forever be our Christmas kitty. 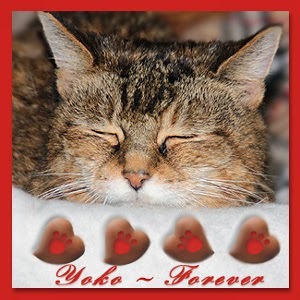 We will see you soon at the Rainbow Bridge Yoka Doke! Thank you all for your kind words of support thru this wild week. I could not have done it without you. I may take a bit of time off from blogging and Facebook but not too long. 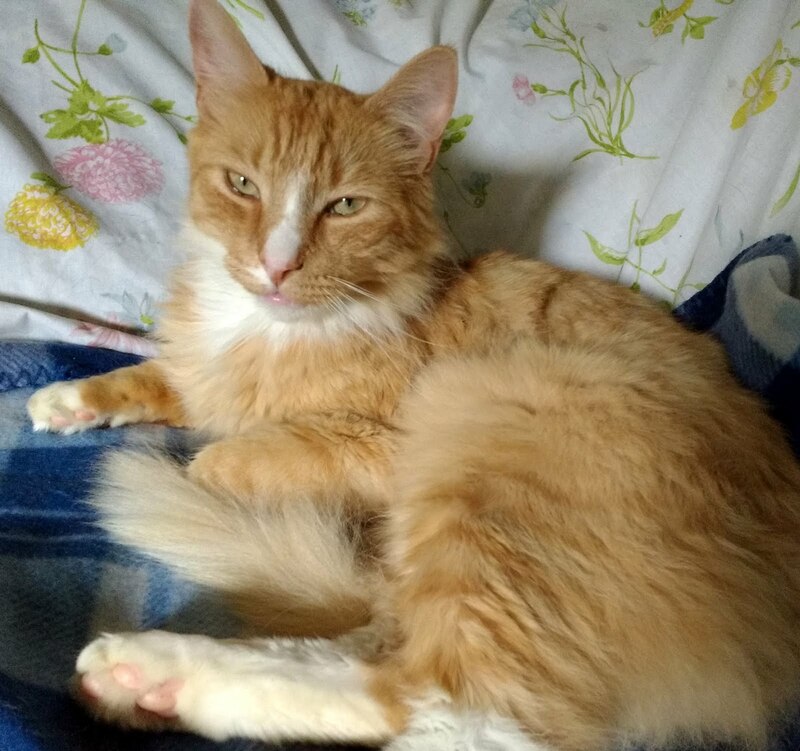 We have other kitties to tell their tales. 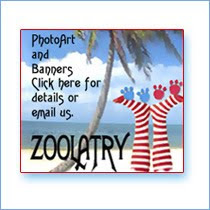 Thank you Ann of Zoolatry for this lovely forever badege. We are sad to hear Yoko has crossed the Bridge.It is good that she had a wonderful,long and happy life with you and that she knew she was loved. What a beautiful post to say goodbye to such a sweet lovely lady. 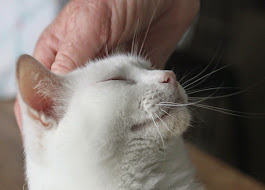 We are sending our purrs and hugs to help ease your heartaches. I only wish there was more I could say my friend. I am sorry that Yoko has made her journey to the Bridge. It is so hard to have to make the decision to help our loved ones on their way even though we know it is the only one. She will be meeting up with many of her friends now and be healthy and young again. Purrs and hugs to all of you. I loved reading this about Yoko. 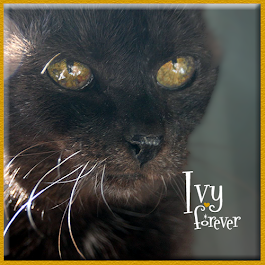 What a wonderful kitty and what a wonderful, loving and long life she had with you! I am very sorry for your loss. I know the time is never long enough. It's so hard to lose them and miss them. I wish you much comfort during this time. We have all been purring and praying for all of you, and we'll continue. Losing one of your li'l jewels is very hard to take, I know. We are sad to hear that your beloved Yoko has gone over the Bridge. 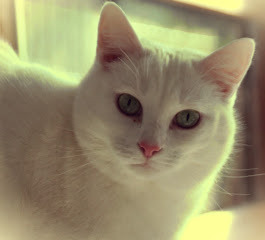 What a lovely cat she was. We're so very sorry that your sweet Yoko has crossed the bridge. We're sending comforting purrs and hugs. Bless you, and bless sweet Yoko. We are so sorry for your loss. Sending hugs and purrs! So many tears for you because we know how hard it is. You were blessed to be able spend your lives together. Even though it hurts now, all those years together were worth it. Purrs to you. Love, Alana & Crepes. Our hearts are breaking, we are deeply saddened to hear of the news of Yoko having crossed the Bridge. Your memorial to her was beautiful, thank you for sharing so many vivid memories with all of us. May God give you strength in this most difficult time. We are very sad to hear it was Yoko's time to cross the Rainbow Bridge. May you take comfort from having her in your life for so many years and the many happy memories. We are so sad to hear the news of Yoko. What a beautiful, heartfelt blog post you wrote. Just lovely and a wonderful tribute to Yoko. Please know that we are sending you comfort. Take care. My heart just aches for you, I was so hoping for a small miracle of a little more time. It's always so hard to say goodbye, it's our lot, I guess. Sending love and purrs from the peeps and kitties here at the Katnip Lounge. We are saddened that sweet Yoko has gone over the bridge. We are all purring hard to give you peace at this difficult time. 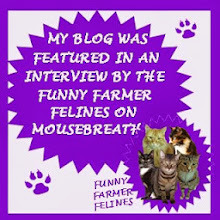 Thanks so much for sharing a bit of her life and purrsonality. I am sorry for the loss of your precious kitty. Hugs and purrs. I am so very very sorry for your loss. What a beautiful girl. Our hearts are breaking for you, but you gave her your final act of love to help her cross the bridge so she would not suffer. We are so sorry that beautiful Yoko had to leave. This is a lovely tribute to her. She will have the sweetest dreams of the wonderful life you gave her and she will keep an eye on you all for a while. We are so very sorry to hear about Yoko. Our purrs to you. Thank you for sharing Yoko's wonderful life with us. I know her passing has left an enormous hole in your hearts. Hope all those sweet memories bring you comfort. Our hearts are breaking for you on the loss of your beautiful girl, Yoko. Such a beautiful tribute to Yoko. You are all in our thoughts and prayers. RIP sweet Yoko. So very sorry for your loss. Yoko was a beautiful soul and your tribute post to her is just as lovely as she was. Sending many hugs and purrs to you all. Our candle for Yoko went out just a little while ago, so we know she's safely over the Bridge. What a life of love she had with you all! 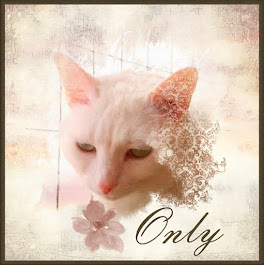 Cheri, that was a beautiful tribute post for a wonderful ladycat, a very special Christmas kitty. I'm so sorry for your loss. Our hearts go out to you. What a wonderful life she had with you. Oh Cheryl I'm so sorry. I wish I could give you a hug. I hope that knowing Yoko had a wonderful life with you helps you through this sad time. We're thinking of you and Target and Guido send purry furry headbutts. We know how hard it is to have sid goodbye to your beautiful Yoko. 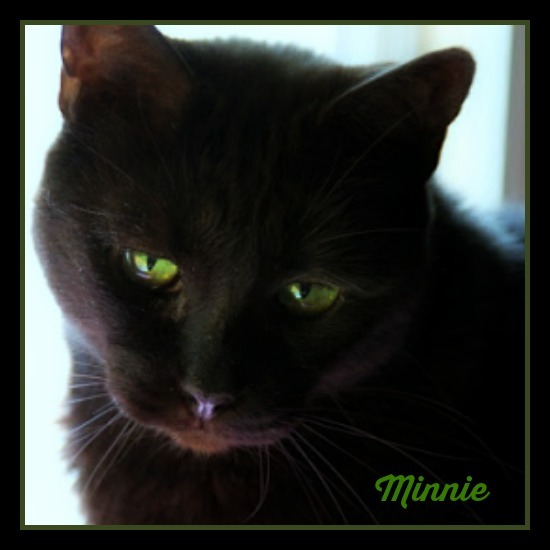 She indeed knew love like so many kitties can only dream of and she gave that love back to you. We all send you our best love and hugs. Thnk you for sharing Yoko with all of us, we felt like we knew her. Run free dear girl. I'm so sorry for your loss. I know that Yoko has left behind many good memories that will always remain in your heart. We feel so lucky that we've been able to share these past years getting to know each one of your cats. I was always amazed at Chica and Yoko. Yoko and those magnificent eyes. 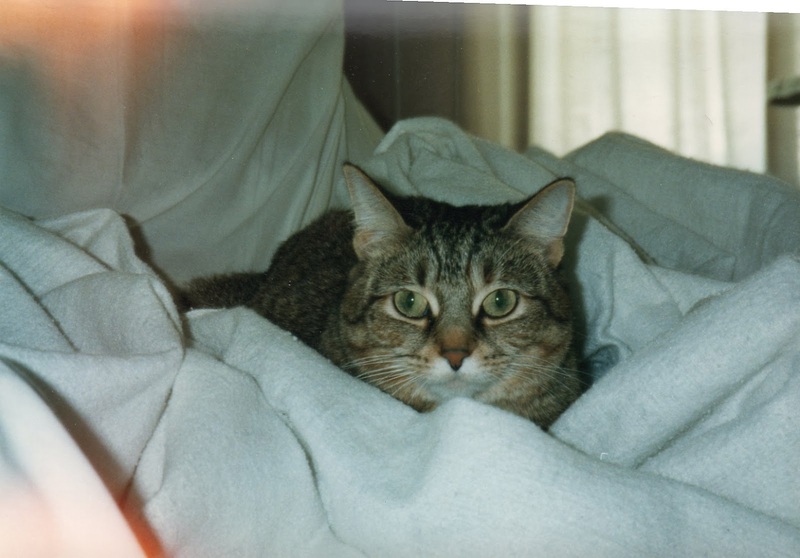 Cheryl I am do sorry she had to make the trip OTRB. You made the right choice for her, but saying it is hard is not adequate for how hard it was for you and Don, even doing so with all the compassion in your heart for Yoko. I know you are relieved she is out of her physical illness and free. Free to be welcomed by Chica and her long lost siblings, both birth siblings and adopted siblings as well as all of her friends, including my beloved Abby. I will keep you on my heart this Holiday as you too will feel the same bitter sweetness I do. Thinking and praying for you both. 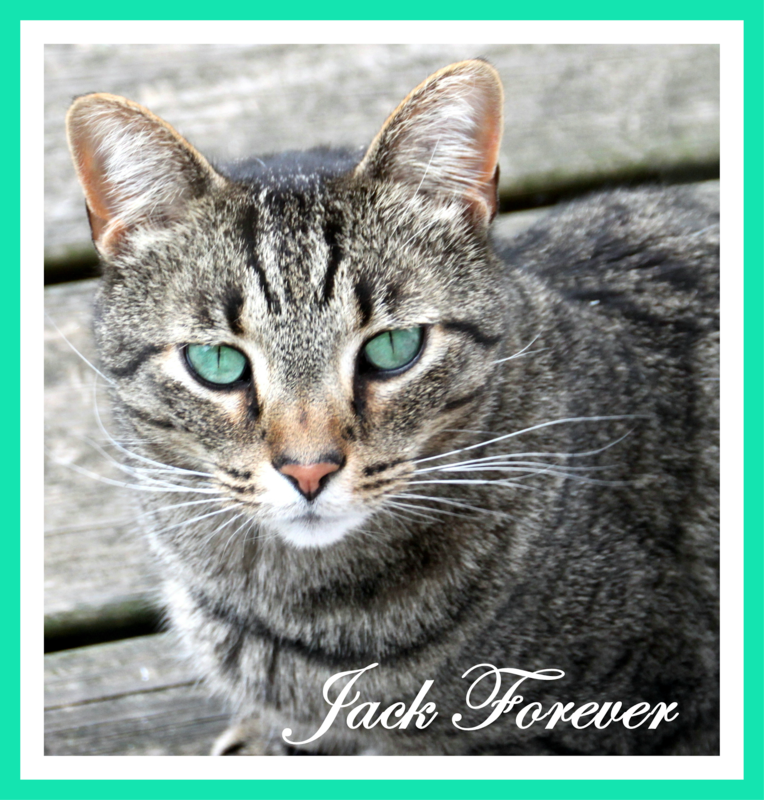 Our heart is breaking for you and your husband - losing a kitty is especially hard when she practically defines a piece of your life. I think it was Yoko's own mindfulness that taught you to be mindful of her illness and to let her go at just the right time. Purrs to you. I’m here to pay my respects to Yoko. *bows head* Sleep tight, Yoko. Your humans loved you enough to let you go. Conforting purrz to those left behind. Your post made her an even more loved darling in my heart than she was. All of your angels were. What a lovely tribute to a very special cat. We are sorry for your loss. 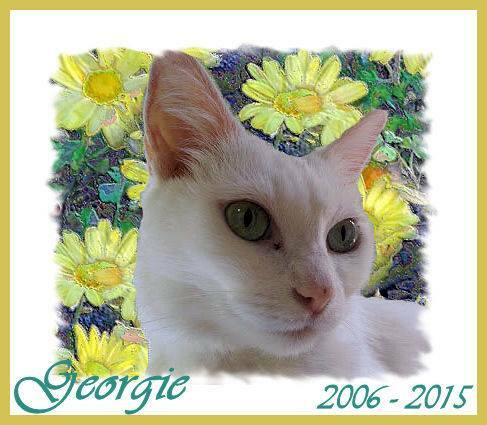 We are sending purrs, headbutts, and hugs to your whole family in this difficult time. This is a beautiful tribute to Yoko. We have an elderly tortoiseshell girl that's slowing down & I needed that reminder to appreciate her during this busy time. We are so sorry for your loss, and hope you find peace. Please accept our deepest sympathy over the passing of your sweet Yoko. She truly was a remarkable kitty girl from your tribute. May she run free in Summerland & may all your memories be a comfort to you now & always. Our hearts are breaking for you, because we know how much you loved your dear, sweet Yoko. What a difficult yet loving and brave decision you made to help her to the Bridge. Thank you for loving Yoko so much, and so well, for all these years. Surely you will all be reunited one day at the Bridge. We are so sad to hear Yoko has passed over the bridge. We remember the birthday post you did with the song "Oh Yoko". It was always one of our favorite posts. Run free and easy, dear Yoko. 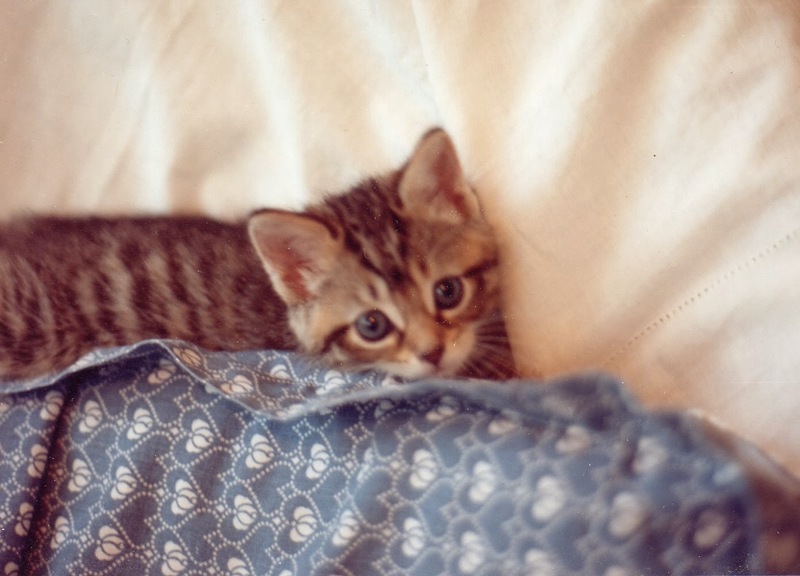 We are purring for all your loved ones left behind. Our deepest condolences. We are so sorry to hear about Yoko. We send you comforting purrs, headbutts and hugs. Such a beautiful and special girl, I am so sorry for your loss. Fly free, sweet Yoko. One can certainly not deny Yoko had one of the fullest lives a kitty could have. Not only that, she had one of the best lives a kitty could have because she had you guys as parents. That said, it doesn't make it any easier to say goodbye. 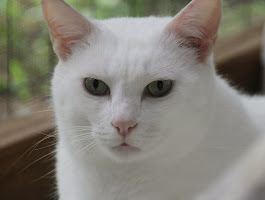 We are sending you our very best comforting purrs during this very sad time. Join some of my best friends, Yoko, you are in very good company there. We're so sad Yoko had to go. Sanjee and Mini will no doubt meet her over the bridge to show her way to her brightest star. 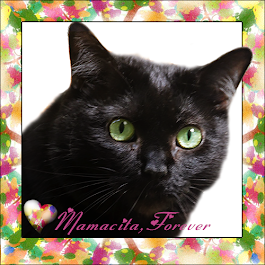 All of us at the House of the Mostly bBlack cats send love and purrs for your sadness. So very sorry it came Yoko's time. It is always hard to let them go. Hugs and purrs. 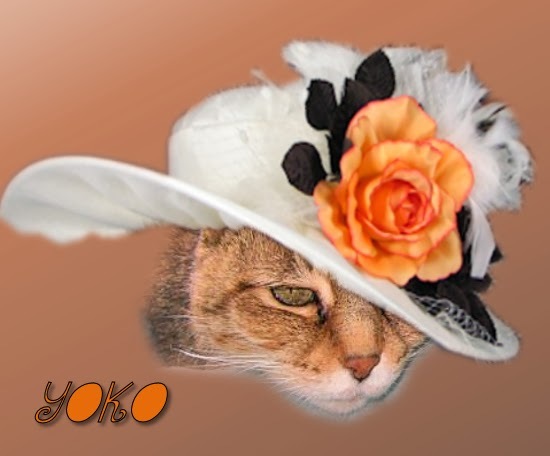 Daddy Kiril and I wish to express our condolences to you all for the loss of Yoko. I'm so sorry and me heart aches for you. You have many years of memories to hold close during this difficult time . I am so very sorry for your loss. May Yoko rest in peace. Oh so sad to hear this. It was beautiful that you put the Christmas tree up for her to see before she left. Such a sweet post for your Buddha girl and how well you both loved her. Wrapping you in light and love and sending you gentle purrs. We are sorry to hear that Miss Yoko had to go. We know how sad you must be. Hugs and loves to you. We will be praying that your hearts will be comforted. R.I.P. beautiful Yoko. My heart is with you and your family. (((Hugs))) and universal Light to you all. 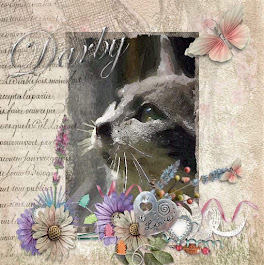 Such a beautiful post for her...We're sad she had to leave, but are so glad she had a wonderful life with you. We really hope and purray 2014 brings you more laughter than tears, more joy than sorrow. Peace and Blessings, and godspeed, Yoko. We sure are so so sorry that Yoko had to go to the bridge. It is just way too sad. It sounds like she had a wonderful life with you and Don. And we also believe that you absolutely did the right thing.You all take care. I send you my love, and my prayers. We're so sad for your loss. Yoko was quite brave until the end but that tumor gave her no choice but to move to that peaceful place over the Bridge and bless you for helping her make that journey. Losing a pet is always hard but somehow more tough at holiday time...particularly if as you say she was a lover of Christmas and all that means. We send hugs of understanding....and great sorrow. We are so sorry your lovely Yoko decided it was time to make the crossing over Rainbow Bridge and can only imagine what a big hole she will have left in your hearts. We are sending gentle head butts and many whiskery kisses in the hope you will know you did the right thing for your sweet lady. Wow, such a hard year for you two... May you find peace in knowing she is now a part of everything and may you find joy in new beginnings. What a lovely tribute to your sweet Yoko. We are so sorry that she had to go to The Bridge. Keeping you in our thoughts and prayers. Rest in Peace sweet Yoko. Leaving lots of warm, gentle hugs for you sweet friend. We are so sorry that you lost your beautiful girl and companion of so many years. You clearly gave her an absolutely wonderful life. 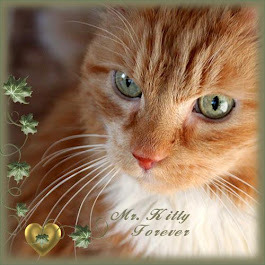 A wonderful tribute for a remarkable cat. We had to make the same decision for our beloved Hemingway. Hugs from us and purrs from the kitties. We learned about this on Katie's blog. We are so sorry to hear about Yoko's passing! 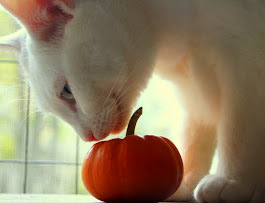 Sending you and the rest of your family many purrs and much love. We are so sorry that Yoko had to leave. It's been such a sad time for many of us but your family especially. We will keep you in our thoughts at this time of healing. I'm so sorry for your loss. A little piece of our heart goes with our furry friends when they leave us. Sending much love and warm thoughts. oh, we are so sorry to read this about Yoko. Rest in peace, little one. We are so sad to header about Yoko's passing. You have our thoughts and sympathies. 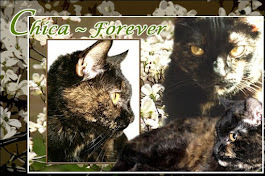 It sounds like she had a wonderful life as part of your family. And we loved the tribute, including the kitten pics of Yoko. We are truly sorry for your loss. Hugs & Lots of Purrs we are sending you and family to help get through this!! We know this wasn't an easy decision to make, but a loving one!! I am so sorry to hear about your sweet Yoko. 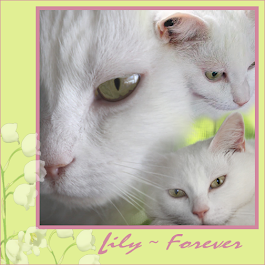 What wonderful memories you have of her and what a wonderful life she lived with you! I am so very sorry that you had to help Yoko to the Rainbow Bridge. You gave her that last and kindest gift--relief from trouble and pain. The cats are purring for you and I send hugs. Beautiful post about a lovely family member. I'm so sorry for your loss. So so sooo sorry about poor Yoyo!!!! All of us will have that time when it is our time to go to the bridge and be back with our beloved dogs and cats!! You will see her again!! Yoko sounds like she was a wise and gentle little soul. She graced your life for so many years, and now she needs a rest. 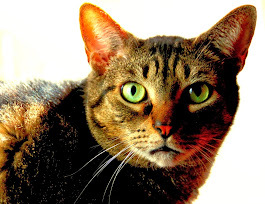 You must do something very right, though, to have such longevity within your kitty family. I think it is love that keep them here, and ultimately love that takes them when their time is inevitably over. I'm sorry for your loss, though you have so many wonderful memories to tide you through this time. Yoko will always be with you in your heart, mind, and in spirit. We just heard the sad news and wanted to add our condolences for your loss. Yoko had a good long life with you and you will always keep those happy memories. We send you comforting vibes and purrayers. We came here from Katie's blog. We are very sorry for your loss but we know Yoko is frolicking at the bridge and will be with you forever. I'm sorry for your loss. Yoko was such a big part of your life for so long. Now she and my Sweet Lady Butterfly are up there waiting for us. We are sad to hear about Yoko. 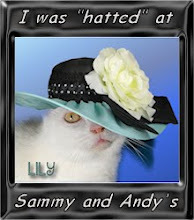 We know she had a wonderful life and a pawsome welcoming committee at the RB. It is so hard to let our fur babies go. Hugs and purrs from our house to yours. I am sorry for your loss. Rest in peace, Yoko. With a very heavy heart and mom typing for me through tears I came to visit and let you know how so so so sorry I was when I learned that sweet Yoko had left for the bridge. I know there are no words that can help but know that Yoko's many friends love and will miss her so much. Forever she will be free of pain and the limits that life had put on her. It isn't good by but until we meet again. Run free sweet friend. The greatest gift of love you could give Yoko was an easy and painless passing. 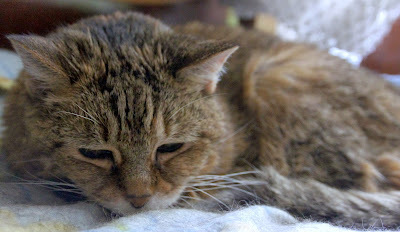 We're sending soft, healing purrs and prayers to you at this sad time. We are so sorry to hear about your precious baby Yoko. 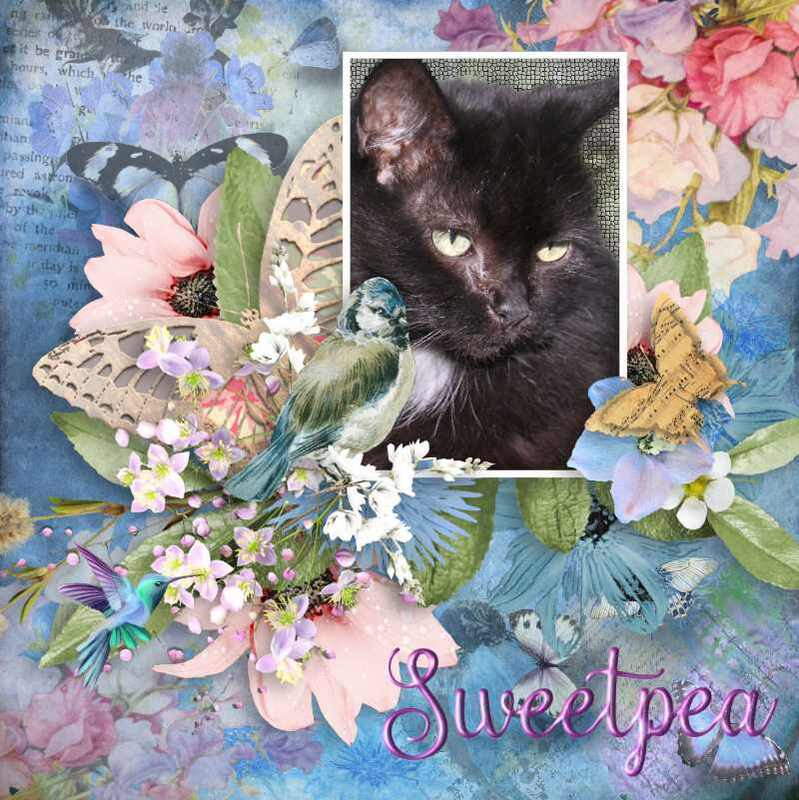 Sending warm thoughts and soft purrs to you..
We are so sorry for the loss of your beautiful Yoko..we too know the pain and especially at this time of year as we also experienced.What a beautiful baby and no words can help,but know we send our love and deepest sympathy. A sad day for all in the Wildcat Woods; I wish it hadn't happened so near to Christmas, but such a loss would have made Christmas sad regardless of when it happened. Please accept my condolences. Godspeed, Yoko. Lovely post for a sweet girl. Sending comforting purrs from us all. I am so sorry for your loss of Yoko. Yet it's so good to read about all she taught you about slowing down and the rest. I am certain she is grateful you helped her be freed of physical pain. We are so sorry to hear about Yoko. Your family is in our thoughts and prayers. I'm so very sorry to hear about your sweet girl. Sending gentle and caring thoughts your way. What a beautiful tribute to sweet Yoko. Thank you, Cheryl, for sharing all of this love with us all. Wishing you peace.